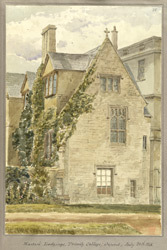 View showing the master's lodgings from Trinity College in Oxford. This was originally a monastic college, established in about 1286 by Durham Cathedral Priory in order to educate their Benedictine monks. Durham College, as it was known, survived until 1544 when it was suppressed in the aftermath of the dissolution of religious houses. However it was refounded in 1555 as a secular college by Sir Thomas Pope. Its new name was Trinity College.